The second trimester is going well! I can't complain. I feel tired, but that's very tolerable and way better than sickness/pain! At 23 weeks I started to have more lower back pain, which is funny because that's exactly the same as Norah! I'm starting to have more problems sleeping, just waking often and tossing/turning a lot, but it's not too bad. Overall, I feel really well and I'm thankful for that! 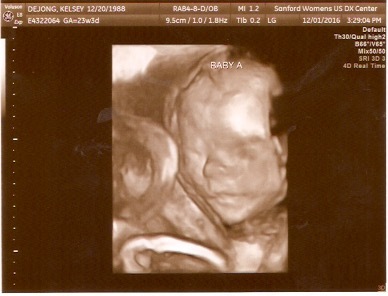 We had to go back for a follow-up ultrasound this week to check on a couple things they wanted to see more clearly when they were a little bigger, specifically with baby A's heart. 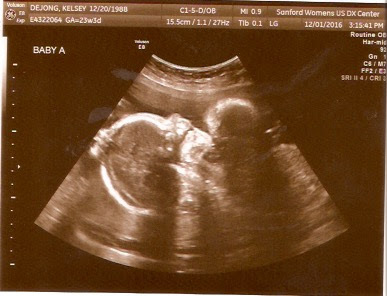 The doctor said that he thought he saw a heart gap at our last ultrasound (I don't really know what that means, but he used the words "heart gap"), so he wanted to check that again. We had a fetal echocardiogram, where they checked both hearts, and we are so thankful that both hearts are strong and well! We know many of our family and friends were praying for that and we appreciate it so much! Baby B's cord is attached to the membrane instead of the placenta (called velamentous cord insertion), which basically means that it takes longer for oxygen/nutrients to get to him/her because it has to travel through the membrane, then through the placenta, then to baby. 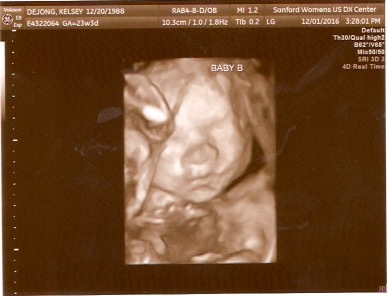 This means that they will have to monitor growth closely to make sure Baby B is growing properly (which isn't really different than normal because they do monthly ultrasounds for twins anyways to check growth), but so far everything is looking great and both babies are growing well. This also means that we will have a C-section, because the biggest risk with this is that labor contractions can cause rupturing, which could quickly turn dangerous for baby B. I was really hoping to try a vaginal delivery, but I am thankful that this isn't a bigger deal, and a C-section is definitely worth it for healthy babies! The doctor said he hopes that I could make it to 36-37 weeks, and the only reason they would come earlier than that is if I started dilating/contracting. All in all, this was the best news we could have gotten! We knew about the cord issue after the last appointment, but they just wanted to check to see if anything had changed. So we've had a couple weeks to digest that news and mentally soak it in. Both babies have strong hearts and are growing as they should, and we are grateful for these two miracles/blessings from God! 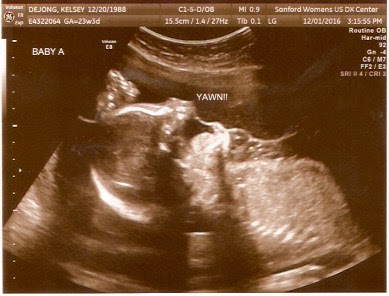 We saw Baby A yawn several times during the ultrasound! I love seeing the 3D pictures- so clear! We do not know the genders, but Kley thinks Baby A is a boy and Baby B is a girl. 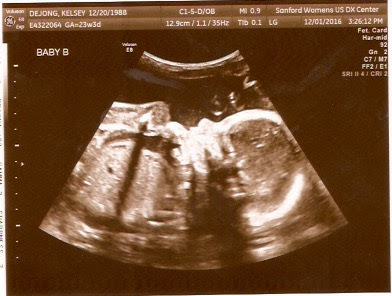 Most people think (myself included) it's the opposite- that Baby A is a girl and Baby B is a boy. 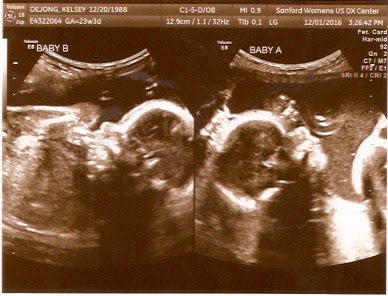 Most people say it's one of each, but my friend told me she thinks it's two boys and my dad thinks it's two girls. We'll see soon enough! So thankful that babies are growing well and hearts are strong!! Love seeing pics!! Thanks! We are so thankful too! Christmas in our house (2016).